The most powerful computing platform requires the best Mac management solution. You wouldn’t hammer a nail with a screwdriver, right? Jamf Mac management software: the tools you need to get the job done. As Mac continues to grow in popularity and cement its place in businesses and schools around the world, you’re being tasked to deploy, inventory and secure this influx of devices. While there is an arsenal of Mac management software choices, most lack the functionality for full lifecycle management. And, Windows management solutions only offer a limited feature set to manage Mac which prevents you from getting the most out of your devices, and takes away from the user experience employees, teachers and students love. and Jamf partnered to roll out the world's largest Mac deployment. of the most successful technology companies use Jamf. of customers renew and grow with Jamf every single year. You deserve a leading Mac management solution. No more closing your eyes and hoping for the best. Depending on the size and needs of your organization, we have a solution for you to help you seamlessly roll out your Mac devices and ensure your technology program is a resounding success. If the basics are what you need, start managing your Mac devices today with Jamf Now. With its intuitive web-based interface, deploying, inventorying and securing Mac has never been easier. While some are very familiar with Mac management, others are diving in for the first time. 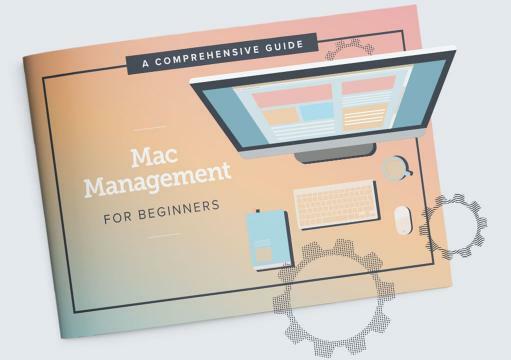 Regardless of where you fall on the spectrum, our guide will help you build and master your Mac management skills, or provide a crash-course in the basic concepts you may not have leveraged in a while. Mac management like no other. Immediate support for macOS releases, allowing you to leverage Apple deployment programs and security tools to enjoy a complete ecosystem of Mac management capabilities. Configure settings like Wi-Fi, VPN, email and other services on your devices quickly and consistently. Automatically collect hardware, software and security configuration details from your Mac devices. Centrally deploy apps over the air and reassign licenses as your needs change. Secure your sensitive data, enforce passcodes and remotely wipe/lock devices. Leverage the Jamf Agent for unlimited flexibility and control, and the ability to automate Apple and third-party software updates. Empower employees with your own app store and let them install apps, update software and maintain their own device without a help desk ticket. Automatically combat security vulnerabilities and ensure your users always get the latest software. Seamlessly pair with Microsoft Intune or Microsoft System Center Configuration Manager (SCCM) to combine Windows and Mac inventory data into a single pane of glass. Making new device setup a snap for IT and their end users. In an age of increasingly mobile world, Mac passwords and clocks get out of sync, DNS records aren't always available externally, and being a member of an Active Directory domain can be a challenge. Jamf Connect relieves these headaches provides leading authentication and account management capabilities to serve IT as they move to cloud-based identity solutions, such as Okta or Microsoft Azure, while ensuring users have the best possible Apple experience. We examine the numbers and put the Mac versus PC in the enterprise myths to bed. Got six minutes? Hear why IBM offers their employees choice and see how they do it.